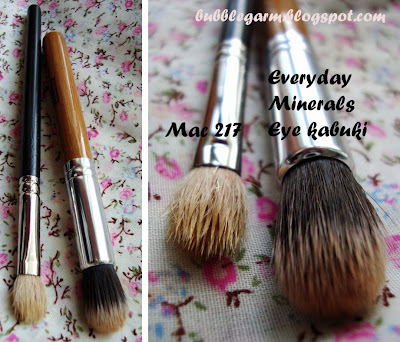 B U B B L E G A R M: Everyday Minerals Flat top and Eye kabuki brush! 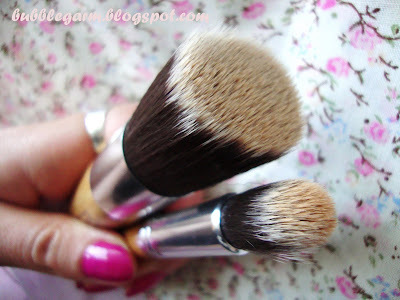 Everyday Minerals Flat top and Eye kabuki brush! Yeap, I purchased some more brushes, I was debating if I needed these and came to the conclusion that I did. I wanted to get the flat top brush from Everyday Minerals as I saw Sardun1 on YT use it to apply her foundation. I wanted the eye kabuki to apply my concealer. 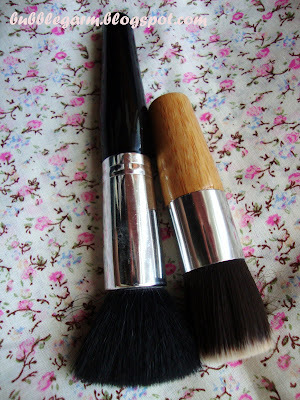 I have used both brushes already and they are amazing. Shipping was fast and didn't cost much. So yay! The bristles on both brushes are Extremely soft and dense! They are made from synthetic fibres and are 100% cruelty free. They have chunky wooden handles, and are quite pleasing to the eye in my opinion. Firstly, look how tiny the Everyday Mineral one is compared to the Jemma Kidd one. I have used the Jemma Kidd for foundation application also and it works quite well. The bristles on the Jemma Kidd one aren't as dense, as you pat it onto the surface all of them spread out. Whereas with the Everyday Minerals they hold its shape giving you more control and coverage. It's just a matter of preference of the effect you want to achieve. The Everyday eye kabuki is meant for the eye area, but it's far too large to use there. It's almost as big as my eye. Look at the size difference with the Mac 217. I like the 217 to apply concealer underneath my eye but I never get round to it as I generally use it to blend my eyeshadow. The Everyday Minerals brush is much larger, making it easier to apply the same amount of product but in a quicker time span as it has a much greater surface area. There we go, I hope this helps anybody who was curious about the Everyday Minerals brushes. They have a wide choice, but these were the only two I considered to be "special". I also received a free 'try me' kit with my order, I opted for the tan collection, I haven't had much luck with mineral make up so I doubt these will perform any better. Either way I shall keep you posted! Do you have anything from Everyday Minerals? Am I missing out on anything? I actually use their foundation (matte) as a setting powder and it's my favorite by far, even compared to BM's matte foundation formula. 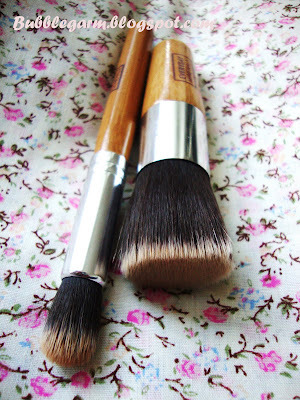 I have those brushes and they're amazing... as well as their regular kabuki brush. They have some nice blushes, but they can be hit-or-miss. The same goes for their eyeshadows... some are nice, some not so great :). @Lex ooo sounds great, I hate bare minerals (ecsentuals) as I am allergic to it! I have the flat top kabuki. It's a really nice brush for the money and I like that it's small. It is really dense though, and I use mineral foundation, and sometimes I find it almost too dense? I guess it definitely is a matter of preference. Regardless of how much I use it, I still think it's a good buy! Actually, Everyday Minerals aren't bad at all. I was never into mineral foundation, but once I tried EM, I quite liked it. Their foundations really look natural, and feel like you have nothing on your skin. I used them in summer during the day, and my skin could actually breathe. Coverage is amazing for a mineral foundation if you get the intensive formulation. Love the flat top kabuki brush as well. I also use their sunlight color corrector. Nothing covers redness like this does. I didn't bring any of my EM foundations with me to London (didn't have enough room), but I'll be reordering if the shipping is not bad. I LOVE their brushes! Actually I prefer their mineral foundation to Bare Esentuals. BE colores are way too limited and EDM has a huge selection. 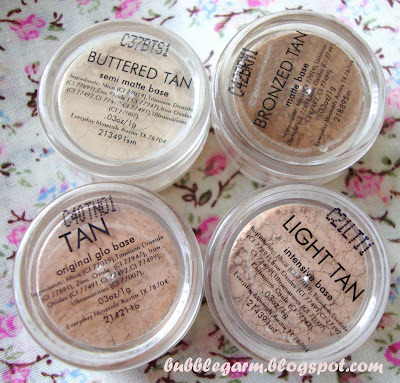 Also love their blushes and some of their setting powders. They just have such a huge selection and it is priced rather inexpensive. I highly recommend them. Becca does a brush similar to the eye brush you featured for significantly more money.. I loved using that flat top EDM brush to apply my foundation wet. I got the most opaque semi-full coverage with that brush. Try that. I also love several of their blushes. Your tan skin needs their peachy blushes! I think their "snuggle" blush would look nice on your skin. It's a great peachy color and is very flattering :). Ah I had never thought to use the Eye Kabuki for concealer, I had been using it to apply powder highlight on my cheekbones. I just wish these two brushes had slightly longer handles! Oh I really wanted to order from EDM but the shipping to the UK for me is like $30. You said you got it cheap. So lucky =). The brushes look good =).